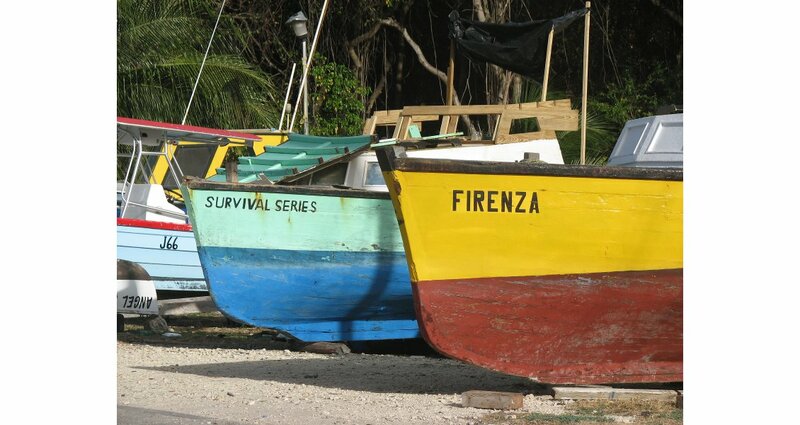 Alluring Caribbean paradise, active accretionary wedge and uplifted reefs. Why are you still sitting there? Barbados, beach paradise in the Caribbean sea. This alluring Caribbean beach paradise is one of the few places on the planet where you can stand on an active accretionary wedge as well as visit a giant’s staircase of uplifted reefs that have played a pivotal role in reconstructing ancient sea levels. The island of Barbados is one of only a few places on Earth where an active accretionary wedge is exposed above sea level. The island emerged about 700,000 years ago, riding on the back of a giant mud diapir, and it continues to rise at an average rate of 30 cm per 1,000 years. Its fringing coral reefs that formed during sea level highstands have been raised along with the island, producing a ‘giant’s staircase’ of coral terraces that constitute one of the world’s most important records of late Pleistocene sea level change. On a scenic half-day drive along the island’s H3 highway, you can examine diapiric mélange in the Scotland District on the island’s undeveloped east coast, ascend the coral terrace staircase, and enjoy sweeping views across the island from 340m-high Mount Hillaby, the island’s highest point. 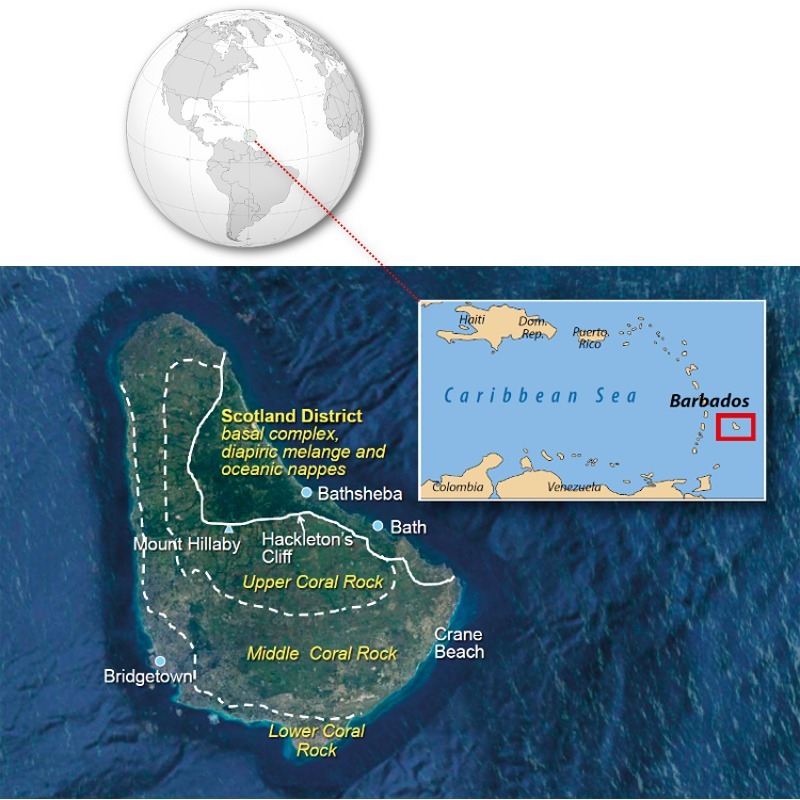 The island of Barbados constitutes the crest of the Barbados Ridge, an especially large accretionary wedge associated with the Lesser Antilles Subduction Zone. 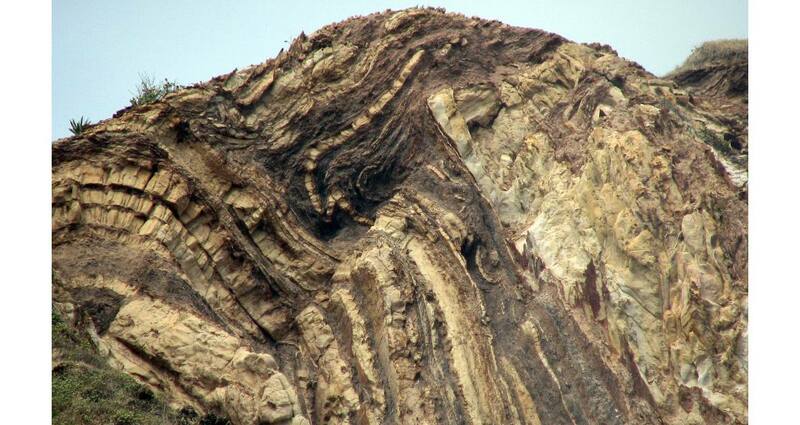 Here the abundant, sandy turbidites that Venezuela’s Orinoco River is delivering to the abyssal plain are being scraped off the downgoing South American Plate and incorporated into the accretionary complex. Oil seep. The Orinoco turbidite system has been studied as a model for the facies architecture of a non-fan turbidite system developing in a convergent margin setting. Researchers have compared the architecture of that modern system to the facies present in Barbados’s Eocene-aged basement rocks, which are exposed at Chalky Mount in the Scotland District on the island’s windswept, central east coast. Some of the turbidites at Chalky Mount display good reservoir characteristics, with amalgamated flows producing several-meter-thick sand bodies with porosities up to 40%. 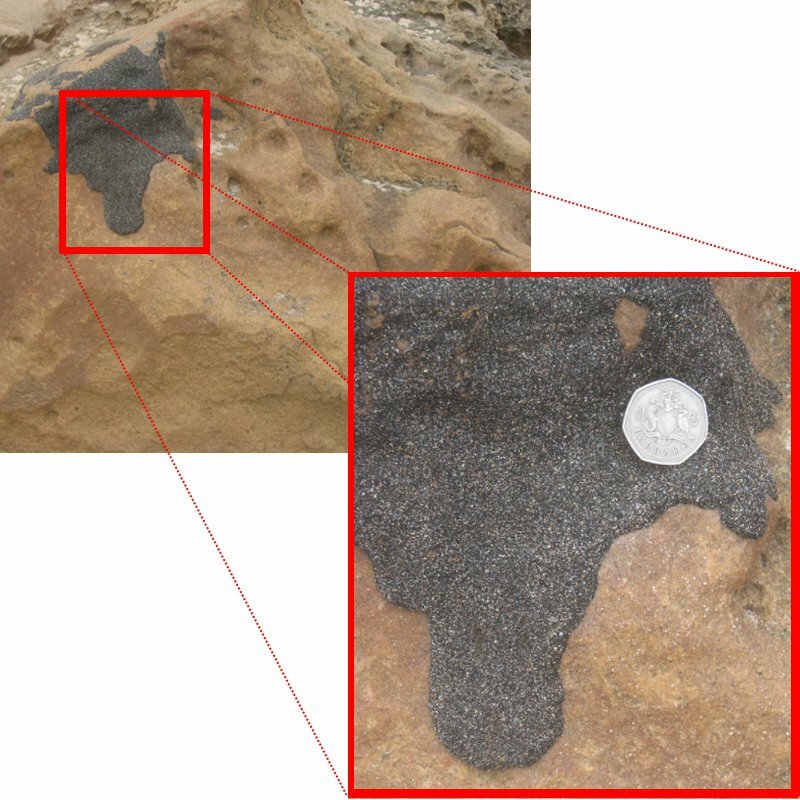 A petroleum seep exists near Bath, and patches of tar are common on central east coast rocks. The island even has a small oil field near the international airport, which produces about 1,000 bopd, enough to meet 11% of the island’s energy needs. 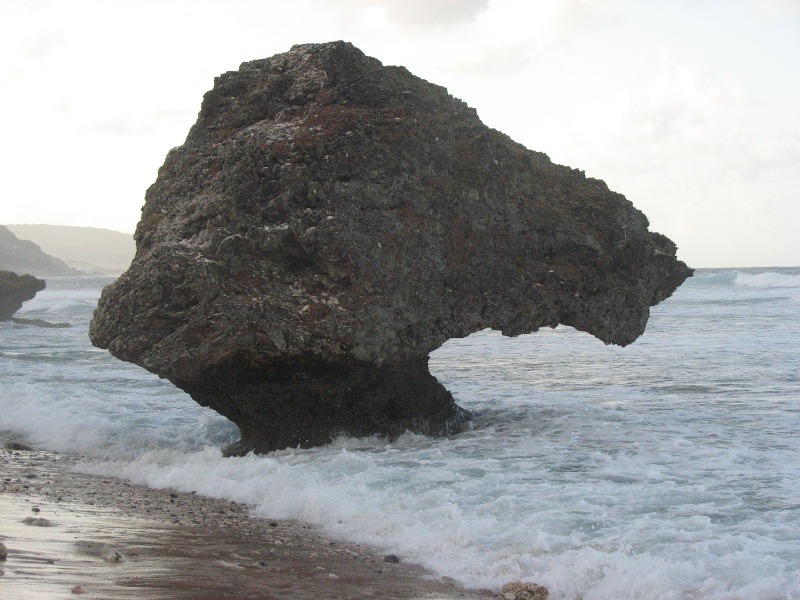 At the famous east coast surfing beach of Bathsheba, outcrops of diapiric mélange contain blocks of widely ranging sizes embedded in a sheared, muddy matrix. The beach is also noteworthy for its row of large, mushroom-shaped limestone boulders that balance on narrow ‘stems’ rising out of the intertidal zone. The stems are formed by the feeding action of invertebrates scraping algae from the rock. 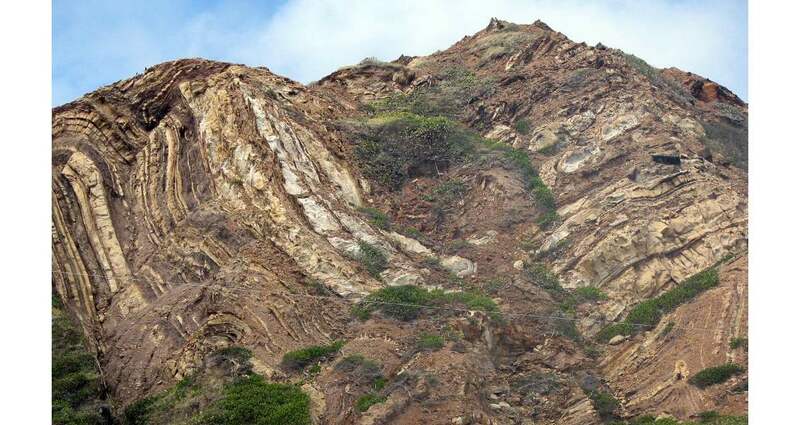 Also near Bathsheba, a series of north-east trending thrust faults has contorted Eocene turbidites into a series of dramatic folds. These basement rocks are, in places, overlain by remnants of an oceanic allochthon consisting of forearc basin sediments that were thrust eastward over the Barbados accretionary prism along a roof thrust. 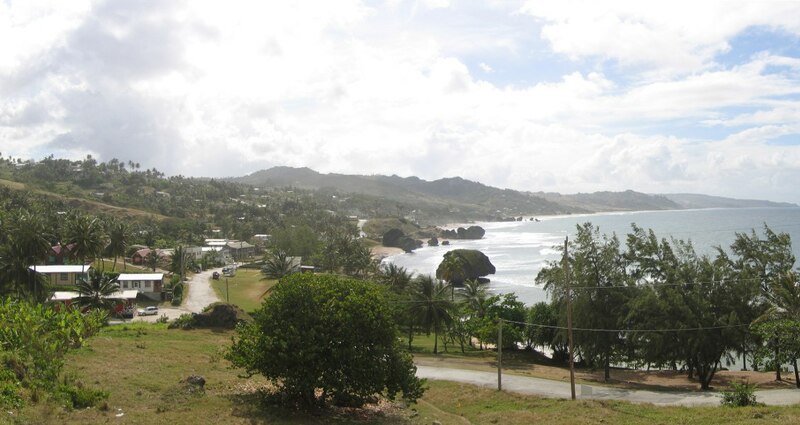 The drive inland from Bathsheba along the highway ascends the island’s coral staircase. The individual treads and risers are most readily apparent in the cleared fields of sugarcane (used locally to craft Barbados’s celebrated rums). Each coral ‘tread’ formed during a Pleistocene sea level highstand, either during an interglacial or an interstadial period. Invertebrates feeding on algae in the intertidal zone formed a series of mushroom-shaped boulders near Bathsheba. (Source: Terri Cook and Lon Abbott) All told, the highway crosses six coral terraces en route to Hackleton’s Cliff, a striking escarpment formed by the erosional amalgamation of several previously separate terraces. The lowest tread, perched a few meters above current sea level, was carved during an interstadial period 82,000 years ago, while the ‘First High Cliff’, about 60m above sea level, was sculpted 125,000 years ago during the penultimate interglacial, when sea level stood six meters higher than it does today. The view from the top of Hackleton’s Cliff is one of the best in Barbados, taking in the rural expanse of the Scotland District down to the windswept east coast more than 300m below. From this vista point, it is just a few kilometers farther inland – and several coral steps higher – to the summit of Mount Hillaby, the top of the island’s highest terrace, which records a sea level highstand that occurred 640,000 years ago. The ages of the island’s terraces match the times of Milankovitch-driven interglacial and interstadial episodes recorded in the deep-sea climate record derived from sediment cores. Since the pioneering coral dating work of Fairbanks and Matthews in the late 1970s, Barbados’s staircase has unlocked one of the world’s best records of Quaternary sea level fluctuations. Their subsequent work, along with that of many other researchers, has progressively refined the ages of the corals using both the 14C and U/Th radiometric techniques. By subtracting the amount of elevation gain caused by the island’s uplift since each reef formed, the researchers were able to calculate relative sea level height. The most precise results came from samples collected from the island’s relatively dry south coast, where diagenesis has been minimal and good specimens of the coral Acropora palmate, whose habitat is confined to the ocean’s upper five meters, have been preserved. Although the terraces record the timing and elevations of sea level highstands, reefs also formed during lowstands. Cores drilled through the terrace flights have recovered material from these lowstand reefs, allowing workers to constrain the timing and elevation of each nadir. The result of these combined efforts is a relative sea level curve for the last 640,000 years that has become the world standard. 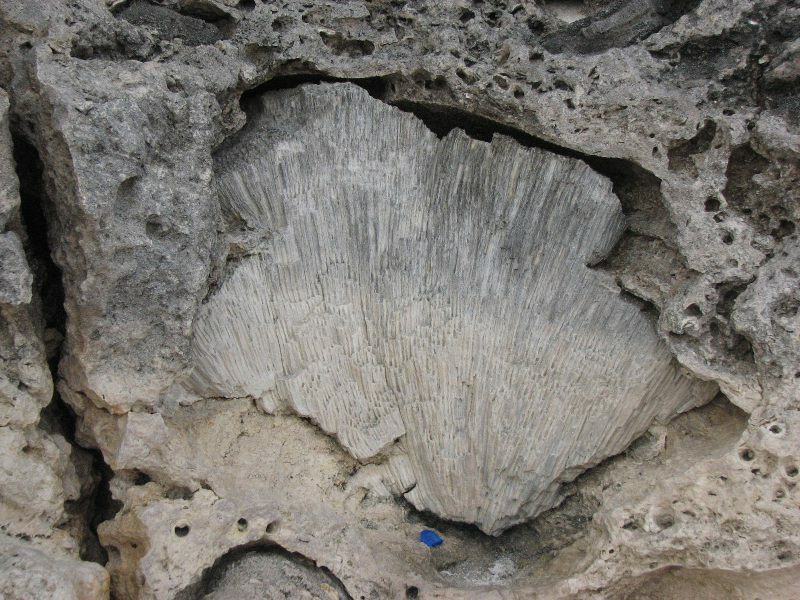 Radiometric dating of coral specimens in Barbados’s uplifted terraces has helped unlock one of the globe’s best records of Quaternary sea level fluctuations. (Source: Terri Cook and Lon Abbott) Relative sea level curves of similar quality have been derived from just a handful of other locations around the globe, including Australia’s Bonaparte Gulf and Papua New Guinea’s Huon Peninsula. Workers have meticulously cross-correlated these various records to both refine our knowledge of Quaternary eustatic sea level fluctuations and compute the global ice volumes necessary to produce them. Early attempts to relate the Barbados sea level curve to the global ice volume during the last glacial maximum employed a 1D viscoelastic plate model. A recent paper advanced this approach by recognizing that mantle viscosity varies in three dimensions near Barbados because of the presence of the subducting Lesser Antilles slab. These recalculations mark yet another refinement in our understanding of eustatic sea level variations. The Barbados relative sea level record has also helped to constrain the measurement of mantle viscosity, a key geodynamic property across multiple disciplines and for which an accurate measurement is needed to properly compute the amount and rate of isostatic rebound that will result from removal of the calculated ice load. A recent paper cross-correlating the Barbados and Bonaparte Gulf records determined that the upper mantle viscosity is likely to be between 1–3 x 1020 pascal seconds (Pa·s), whereas the lower mantle viscosity ranges from 5–10 x 1022 Pa·s. 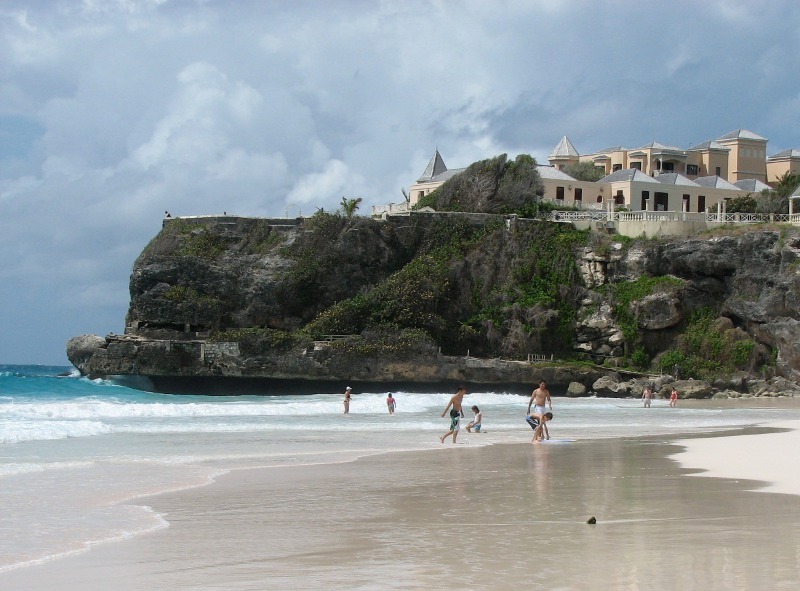 Unbeknown to most tourists, the Crane Hotel above beautiful Crane Beach rests atop an 82,000-year-old limestone terrace carved during an interstadial period. 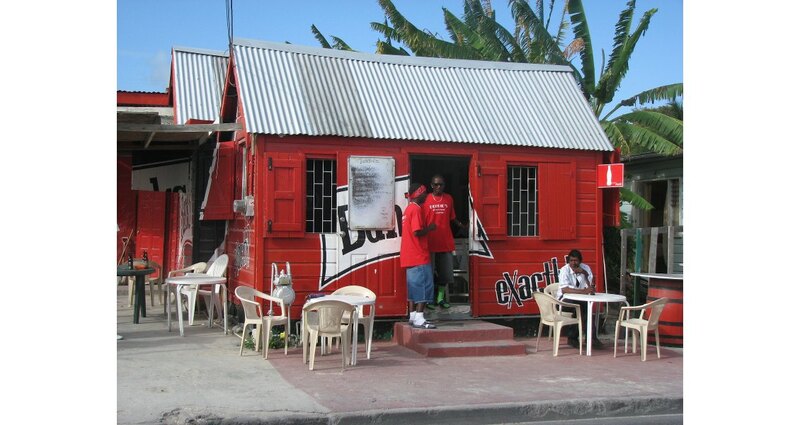 (Source: Terri Cook and Lon Abbott) After summiting Mount Hillaby, it’s also worthwhile visiting three nearby geotourism attractions: Hunte’s Gardens, Welchman Hall Gully, and Harrison’s Cave. The last is a stalactite-adorned grotto that can be toured via electric tram or on foot. The gully, which formed in an adjacent cave where the roof later collapsed, preserves a scrap of verdant tropical rainforest, as do the tranquil Hunte’s Gardens. 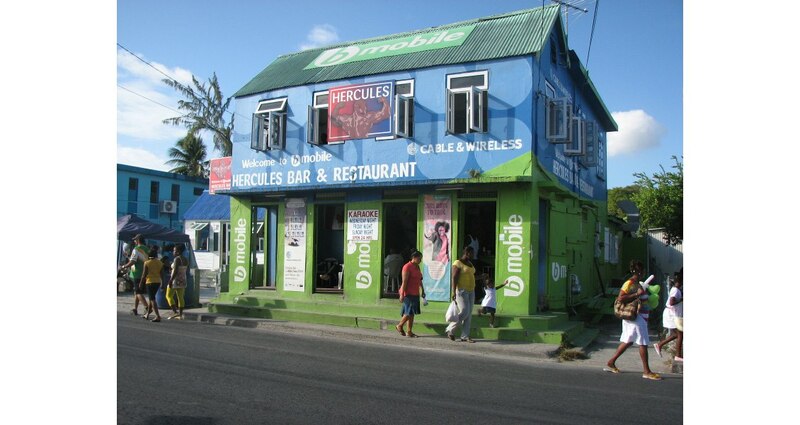 Barbados is best known for its modern reef, which you can view via an Atlantis Submarines tour or, if you prefer to get wet, by snorkeling or using one of the island’s many dive operators. For simply lazing on the sand, it is hard to beat gorgeous Crane Beach, rated one of the ten best beaches in the world by Lifestyles of the Rich and Famous. Above its sparkling, white sand, the Crane Beach Hotel is dramatically situated atop a cliff of 82,000-year-old limestone, the lowest staircase tread. While many visitors never leave the swanky beach resorts, those who do venture farther afield, even for half a day, will be captivated by its world-class geology.